My mother recently assisted one of her friends in creating a look for an upcoming event. They eventually found themselves speaking on the topic of personal style and how one can determine their own. This is where I got the idea to write this post! You'd find that many of today's most beloved fashionistas have a distinct style that we all can identify. For example, Rihanna is nothing short of anything risqué and Solange Knowles has a more eclectic sense of style that we have all come to adore. Have you ever spotted a piece of clothing while shopping and automatically associated the garment with someone you know? That's because they've established a sense of style that everyone can identify. If you're just getting into fashion or not as creative with your clothing choices, developing your personal style can be a bit of a challenge. 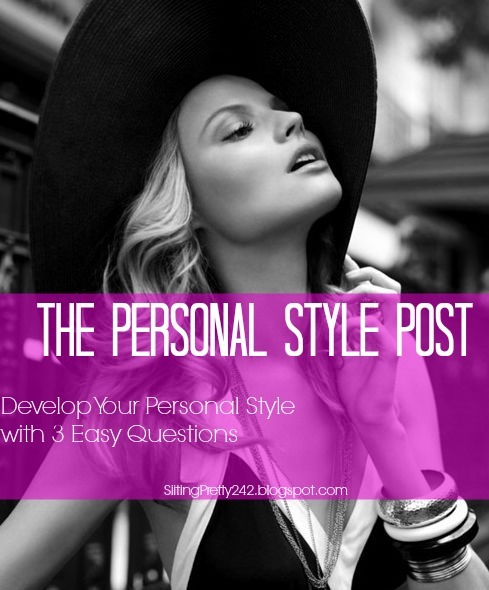 Luckily, I came up with three questions that can ask yourself to assist you in determining your personal style. One of the reasons many people fall in love with fashion is because it allows you to express yourself without saying a word! In order to cultivate your own personal style you must first look at your life. (A bit dramatic, but true!) What sorts of activities do you participate in on a daily basis? Are you a student or do you work in an office? Do you party often or are you more of a chill/casual sort of person? Also, who do you aspire to be? All of these factors can determine who you are and what you want the world to know about you. After establishing who you are it is much easier to determine your trademark. If anyone truly knows me, they know that most of my free time is spent on social media drooling over outfits that I've stumbled upon. This is where I draw my inspiration, and eventually develop my own unique ensemble. If you're not as creative with styling your outfits, I recommend you do the same. I often start my journey with Pinterest mainly because it’s so easy to use. I also check out a few Fashion Bloggers on Facebook & Instagram. (I'm really into GabiFresh these days.) Sometimes I'll even look in a few magazines (Lucky and Instyle are my favorite!!) for a little more inspiration. However, while being inspired by these style outlets is perfectly fine; it is NEVER okay to copy! Copying defeats the purpose of PERSONAL STYLE! You always want what you're wearing to be a complete reflection of who YOU are. After successfully answering these three questions, you'll be one step closer to mastering and OWNING your own sense of style. How would you define your style?My mother recently assisted one of her friends in creating a look for an upcoming event. They eventually found themselves speaking on the topic of personal style and how one can determine their own. This is where I got the idea to write this post! You'd find that many of today's most beloved fashionistas have a distict style that we all can identify. For example, Rihanna is nothing short of anything risque and Solange Knowles has a more eclectic sense of style that we have all come to adore. One of the reasons many people fall in love with fashion is because it allows you to express yourself without saying a word! In order to cultivate your own personal style you must first look at you life. (A bit dramatic, but true!) What sorts of activities do you participate in on a daily basis? Are you a student or do you work in an office? Do you party often or are you more of a chill/casual sort of person? Also, who do you aspire to be? All of these factors can determine who ypu are and what you want the world to know about you. After establishing who you are it is much easier to determine your trademark. If anyone truly knows me, they know that most of my free time is spent on social media drooling over outfits that I've stumbled upon. This is where I draw my inspiration, and eventually develop my own unique ensemble. If you're not as creative with styling your outfits, I reccommend you do the same. I often start my journey with Pinterest mainly because its so easy to use. I also check out a few Fashion Bloggers on Facebook & Instagram. (I'm really into GabiFresh these days.) Sometimes I'll even look in a few magazines (Lucky and Instyle are my favorite!!) for a little more inspiration. However, while being inspired by these style outlets is perfectly fine; it is NEVER okay to copy! Copying defeats the purpose of PERSONAL STYLE! You always want what you're wearing to be a complete reflection of who YOU are. STYLE CRUSH | Meet Cheryl V!